On September 20th, this year, the World Anti-Doping Agency’s (WADA) Executive Committee made the decision reinstate the Russian Anti-Doping Agency (RUSADA). WADA’s 12 person Executive Committee had met in Seychelles to vote on a recommendation from the Compliance Review Committee (CRC) that RUSADA’s suspension be lifted. Nine Executive Committee members voted in favor of the CRC’s recommendation, two voted against, and one abstained. Days before WADA decided to reinstate RUSADA, former Canadian cross-country skier, Beckie Scott, stepped down from her position on the CRC. Scott, one of the most outspoken athletes on anti-doping, was one of six members on the CRC panel. Scott remains the chair of WADA’s Athlete Committee. On October 12, the BBC posted a video interview with Scott during which she explained her decision to leave the CRC. The three-minute video interview–which can be accessed by clicking here–reveals that Scott felt she was “treated with a level disrespect” by her WADA colleagues at the meeting. Scott departed her position due to a “fundamental disagreement” with the decision to reinstate RUSADA and the way she was treated at the meeting. In 2004, Scott was awarded a long-awaited Olympic gold medal after two Russians were stripped of their medals from the 2002 Salt Lake City Olympics for failed drug tests. At WADA’s meeting this September, Scott said the “comments and gestures that were inappropriate” and directed toward her when she produced statements from those opposing the reinstatement went unchallenged from WADA’s president and director general. Scott described the tactic as one meant to “bully” her. “I think that there has been an incredible loss of confidence and faith in the organization as a result of this,” Scott said. “I think all the athletes have been galvanized by this. They have seen fit to express their frustration on a level that I have never seen before. I think we are seeing an unprecedented level of outcry, of outrage, of mobilization of the athlete voice as a result of this. 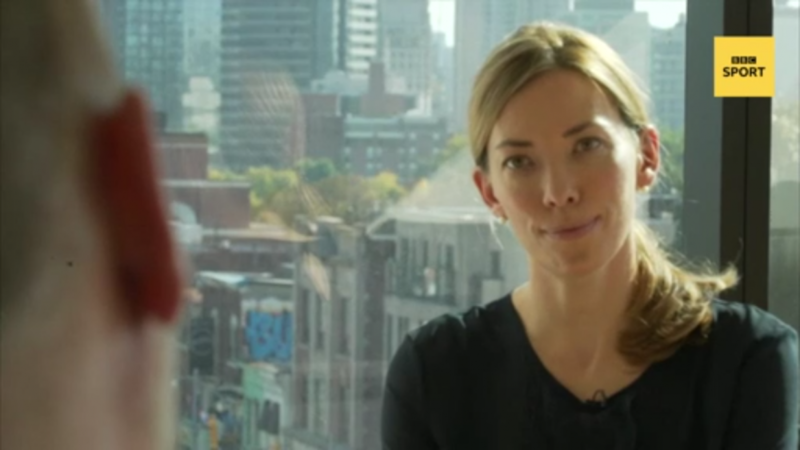 The alleged behavior from members of WADA has the Canadian Centre for Ethics in Sport (CCES) and AthletesCAN pushing for an independent review of the incident. A full transcript of Scott’s interview with the BBC is presented below. Beckie Scott (BS): I made the decision based on the fact that I fundamentally disagreed with it. I felt that this was a compromise that was unacceptable. I would say I was treated with a level of disrespect and with comments and gestures that were inappropriate. And indicative of a general attitude of dismissal and belittling of the athlete voice at the table. BS: That was behavior directed at me by the members of the Olympic movement who are members of the WADA Executive Committee. BBC: So members of the Olympic movement in the form of an Executive Committee meeting said things that were designed to denigrate, intimidate, dismiss? BBC: To Bully? They tried to bully you? BBC: Can you tell me now that was done? BS: I mean just through comments, through gestures. There was laughter when I read the list of athlete committees who had produced statements and who were confronting this decision. It was all, it was a combined effect that left me feeling as though there is very little respect, there is very little appreciation, and there is very little value for the contribution that the athletes have at this table. BBC: What about WADA’s president and Director General, did they step in or say anything? BS: There was no confrontation or challenging of that behavior at the time it took place. BBC: You disappointed by that? BS: I was disappointed by that. I think it is indicative of two things: one is the lack of regard for the athlete’s voice generally. I think that there has, there has been this um, attitude of dismissal, of belittling, and marginalization, sidelining of the athlete’s voice. I think it is also indicative of the leadership of WADA’s alignment with the Olympic movement. BBC: Is WADA’s reputation at an all-time low among athletes? BS: I think that there has been an incredible loss of confidence and faith in the organization as a result of this. I think all the athletes have been galvanized by this. They have seen fit to express their frustration on a level that I have never seen before. I think we are seeing an unprecedented level of outcry, of outrage, of mobilization of the athlete voice as a result of this. BBC: Is WADA’s future on the line here do you think? BS: I think something needs to change. And I think that the time is now. We need a return to integrity based decision making. A return to a place where athletes are valued and contributing members of the organization and a return to what sport is fundamentally all about.